Fast forward to today and that is no longer the case. USB-C monitors are made by quite a few manufacturers with ASUS being the most notable company producing USB-C monitors at this point. One problem these extra screens suffer from, however, is the lack of decent brightness and port selection. 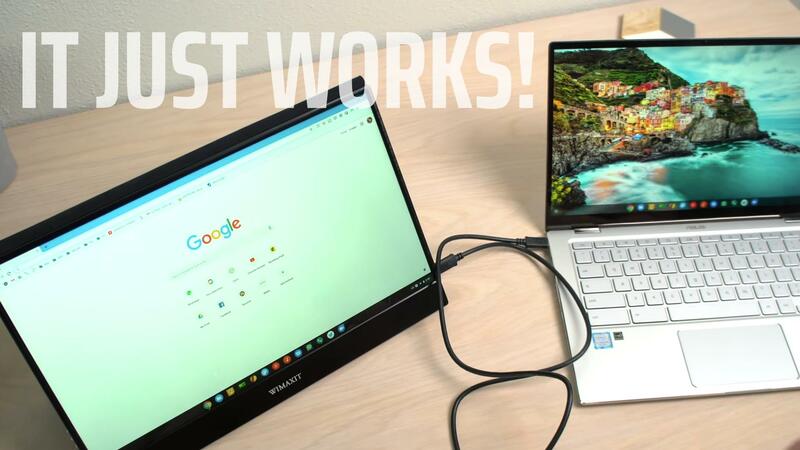 The low brightness makes sense as portable monitors draw from your laptop’s battery, but the lack of touch in the current climate of touchscreen Chromebooks feels like a misstep. Today, we’re unboxing a device that solves both of these issues and comes from a company we’ve honestly never heard of. I don’t know much of anything about WIMAXIT, but I can tell you that this portable monitor is brighter than any that I’ve used and the touch input out of the box JUST WORKS. No drivers, no installs, no work whatsoever. While we’ve used USB-C monitors in the past, we’ve not used one with touch support. I honestly wasn’t sure it would even register. Instead, the monitor fired right up over a single USB-C cable (included) and multi-touch worked exactly as expected. The benefits are obvious, too. If I’m working on one screen and simply need to move something on the second display, I can now just reach right up, touch the screen, and do what needs to be done. We’re going to spend a bit more time with this screen in real scenarios out and about and do a full review in a few weeks, but I can tell you I’m already impressed. This screen looks great and the touch functionality works better than I could have possibly thought. The case on the device is not the one that is shipping from Amazon right now and the manufacturer is sending us a replacement that won’t be so wonky, but my real concern in all this is the performance of the screen itself. And on that front, this thing seems to deliver in a big way. Check out the unboxing and hands-on video above to see it in action, subscribe to the YouTube channel so you don’t miss the full review, and snag one for yourself if you are already sold on it!